I guess it's true... a universal truth that we, the new generation are much more rude to our parents than they were to theirs. I mean, it's not like they never rebelled against their parents. Despite what some of our goody-two shoes 'rents say... they all rebelled against their parent. After all, as unlikely as it is, they were all teenagers at some point in their lives. But it's safe to say that they didn't loudmouth their rebellion as we do now. Parents were approached with caution and respect. No stray hairs in sight, feet tucked in, shirts and pants meticulously ironed, manners of full display. “Ma, are you well? Have you eaten? Do you need anything?” None of that tumi stuff either... even now my 'rents address their parents as apni. Which baffles me, because I often address my mother as “ei Ma”. These days most of us are extremely rude to our parents. Whenever I see my parents address their parents, the respect and courtesy almost shocks me. No cursing, no swearing, polite addresses, enquiries, there's an underlying familiarity somewhere in there, but overall there's a distance that's maintained at all times. Most of these boundaries don't even exist when we talk to our parents. 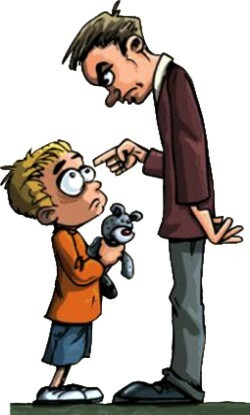 Swearing freely in front of Dad is hardly prohibited, and he's not under any misguided illusion that his wonderful kids are... uneducated. Courtesy is unheard of; this is the woman who carried me around in her stomach for nine months and if I just act goody-two-shoes in front of her, she ain't buying it, so what's the point? We never hesitate to slam doors in anger, or argue back vehemently. Of course, the extent of rudeness varies from kid to kid. Some teens don't swear in front of their parents, while others don't hesitate to swear at them. One thing that's universal is the glaring. If they scold us, hit us, insult us, and we can't do anything about it, we glare. Which is, in their books, another form of beyadobi. And boy do we know it. Talking back is, I guess, one of the biggest differences between us and them. As our parents never fail to (continuously) remind us, we do not think twice about talking back. Did they just say something I don't agree with? Did they just accuse me of doing something? Did they just repeat that for the umpteenth time? Did they just say something that is logically incorrect? Well, now they stand corrected. Before, teens never dared to talk back to their parents. The parent is always right. In this day and age, that's ridiculous. Parents are never right. Maybe it's because corporeal punishment isn't as wide-spread anymore. Don't get me wrong, we all had our fair share of getting beat up for bad behaviour, bad grades and bad language. But I'm guessing that our grandparents kept their kids on a much tighter leash than our parents are able to keep us. Back then, it was safer. My dad wandered around town all day without restrictions; my Dadi would hear all about it the next day anyway, and then he'd have all hell to pay. Rules were set and followed. If we walk around the city, our parents won't have an inkling as to where we spent our time, so they have no way of knowing what to punish us for. And like my mom loves to say “Tumi TV dekhe dekhe erokom hoe geso (You've become like this by watching TV).” Maybe it's slightly true; after all. Let's just blame it on the parents. They actually tolerate our horrible behaviour; like they always say their parents never tolerated any wayward behaviour. It's their fault for not completely brainwashing us when we were small so that we would look upon them as lovable dictators. Of course, it's not all bad. We're much more familiar with our parents than they were with theirs. Ever noticed that when your parents talk to your grandparents, there's a distance, a clear line that is never crossed? Well, obviously that's absent in our relationship with our parents... or the line is slightly hazy. Sometimes our forwardness causes communication gaps... and sometimes it bridges them. The fact that we speak our mind helps parents know exactly what's bothering us, what we don't like, what we think they did wrong and what flavour of ice cream can fix it. The stage was a half circle extending out into the crowd. The crowd was a collection of chairs around a circular table and about twenty tables scattered about the oblong room. A bar nestled to the left of the stage, two barkeeps bustling about. A thread of waiters slowly moved about the room delivering drinks. The lighting had been deliberately dimmed; focusing mostly on the stage but even there it didn't extend very far, keeping the tattered paint on the back wall mostly in the dark. A man walked onto the stage, carrying with him a small three legged table which he settled on the stage. He didn't offer an explanation for the table, and his quiet demeanour drew the eyes of the people in the room. They watched as the man got off the stage and made his way to the bar. He spoke a few quiet words with one of the barkeepers and returned to the stage carrying a champagne flute, a clear plastic disposable cup and a bottle of water. He set them on the table, the flute and the cup, and proceeded to pour water into them stopping about halfway with both. He did all of this without once addressing the audience, who had kept watch on him, their interest piqued. A magic show? Water into wine? Maybe even champagne? The voice was deep and rich and spoke of years of vocal training behind it. Every word enunciated just so, thrown at the audience like banter exchanged across the table. The audience this time was left unsure about whether to laugh or simply ignore the man who had taken to staring at the glasses of water. This time the audience offered a smattering of laughter. Some of them, those whose interest had drifted, looked back at the man who was still staring at the table with the glass and the cup. Those at the bar had taken an interest by this point. The barkeepers exchanged a small smile, as if they had seen this scene a thousand times and knew what to expect. The change in the simple oblong room was evident. Just a few minutes before there had been the chatter of animated voices, chairs scraping as their occupants moved. Now, only the rustle of waiters bearing drinks and the occasional clink of a glass broke the silence. The man's voice had taken on a lulling tempo, keeping the audience interested with nothing but the highs and lows of the words he spoke. The audience laughed at this, but not with the mirth one would expect. The man had managed to infect them with some of his restrained melancholy. And with that the man quietly walked off stage. The audience, as if jolted from a reverie instantly became animated. They looked at each other, across the table, across the room, trying to piece together what they had just witnessed. A man, at the bar beckoned one of the keeps over. The barkeeper smiled. The man on the stage had asked where the meaning was. It was right here, but it had nothing to do with art.